The XS202 is a bi-directional RS232 to RS422 converter which is port-powered but with an optional external power terminal which allows you to power the converter from an external 5VDC power source (6-pin screw terminal header is required for this option) in case your serial port does not provide sufficient power to the converter. This RS232 to RS422 converter supports 4-wire balanced full duplex communication, which allows your applications to operate in full-duplex. The transmission rate of 300 - 115200bps can be applied to point-to-point and point-to-multipoint networks. It is suitable for most applications, including industrial, commercial and any general office computer device. 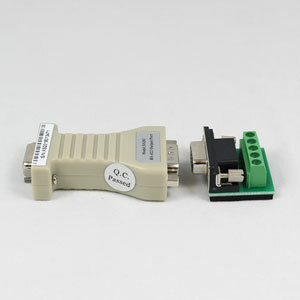 This converter is a bi-directional RS232 to RS422 converter, (meaning it communicates in both directions), reliable and cost-effective which easily lets you connect any RS422 device directly to your computer's serial RS232 COM port, efficiently converting standard RS232 to RS422 signals in full-duplex RS422 and vice versa, without the need for any drivers or other control software. This particular converter utilizes the popular MAX491 processor chip from Maxim/Dallas Semiconductor and a supporting driver chip from Philips. A simple and reliable RS232 to RS422 converter for most general and industrial communication needs. 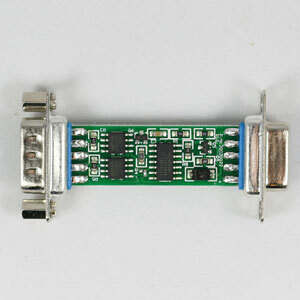 A 5-pin screw terminal header board is included with each converter. If you need to apply external power to this converter then you will need a 6-pin screw terminal header board. Using a RS232 to RS422 converter as an extension cord. You can use a RS232 to RS422 converter simply for converting RS232 signals to RS422 signals, for example if you need to communicate with a RS422 device via your computer. 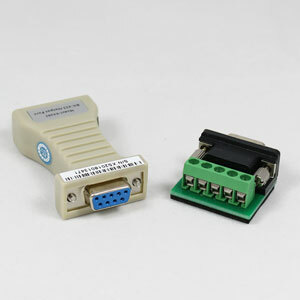 However, another common use for this type of converter is for extending a RS232 connection. You do this by placing a RS232 to RS422 converter at each end of the two RS232 devices you wish to extend and then run the RS422 signal between the two RS232 to RS422 converters. This way you can extend the distance between two RS232 devices up to 4000 feet. How does a RS232 to RS422 converter work? 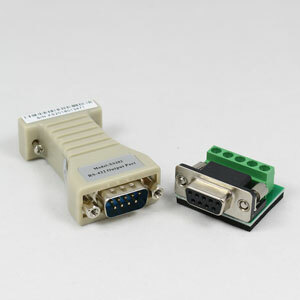 A RS232 to RS422 converter takes a standard two-wire RS232 signal and converts it into four wire balanced differential data transmission, the converter does this bi-directional, meaning in both directions. The RS422 converter was designed for communication over long distances, up to 4000 feet, and is ideal where electrical noise might be an issue, since the RS422 converter due to its differential signaling is more resistant to noise than other communication protocols. RS422 is a full duplex protocol which means that the converter can transmit RS422 data and receive RS422 data at the same time. Another advantage of the RS422 converter is that it can reach speeds of up to 10Mbps if it has been designed for these high speeds. As with most other converter units the RS422 converter is transparent to the devices its connected to, it is usually classified as an automatic RS422 converter which means that it automatically takes care of timing problems in relation to the software or device it is connected to. For wiring the converter we always recommend using 4-wire twisted pair cabling with a ground wire for reliable communication. Shielded and twisted wires reduces surrounding electrical noise most possible. Sometimes it can be difficult to troubleshoot a communication system with a RS232 to RS422 converter. Its often hard to determine what is causing the fault, so a good idea is to first check if the RS232 to RS422 converter is working properly. Checking if a RS232 to RS422 converter is working properly is actually very easy. The first thing you need to do is to connect the RS232 to RS422 converter to your computer, you can use a USB to RS232 converter if you dont have a built-in RS232 or RS422 port in your computer. Then you install a terminal program such as AccessPort or Hyperterm on your computer to start sending data through the serial port. With the RS232 to RS422 converter connected to your computer and while sending data to the RS422 port of the converter you simply loop-back the TX and RX signals on the RS232 to RS422 converter. If you are getting data back through the RS232 to RS422 converter and can receive it in your terminal program then the RS422 converter is most likely working properly. Chose the right RS422 converter for the job. 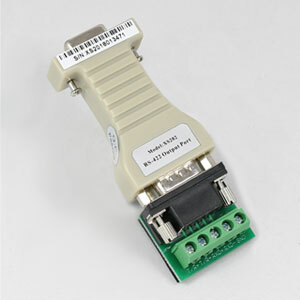 We have several models of RS232 to RS422 converter units. Since it is important to chose the right converter for the job we recommend that you take a closer look at the different models available. For alternative solutions please see our full line of RS232 to RS485 / RS422 converters.